The Tupolev Tu-28 (NATO reporting name Fiddler) was a long-range interceptor aircraft introduced by the Soviet Union in the 1960s. The official designation was Tu-128, but this designation was less commonly used in the West. It was the largest and heaviest fighter[nb 1] ever in service. In the 1950s, the Soviet Union sought means to defend against nuclear-armed American bombers possibly penetrating its borders (especially its long and vulnerable northern border), flying from northern Soviet northern bases like Talagi Airport and Savatiya (air base). Contemporary interceptors, even the Yakovlev Yak-28P, were able to cover only a radius of a few hundred kilometers; the newly developed surface-to-air missiles had even shorter range(the standard Soviet SAM S-75 Dvina's range is 45 km (28 miles)). Considering both, the sheer numbers required to defend a 5,000 km air front[nb 2] were economically impossible to maintain. This left the Soviet Union able to provide a modern air defense only for selected valuable areas. The PVO decided to cover the entire territory, but with a looser defense. In 1955 it placed a requirement for a large area-defense interceptor, that would achieve it with sparse[nb 3] airbases. The PVO requirement called for a supersonic aircraft with enormous fuel tanks for both a good patrol time and long range, a capable radar, and the most powerful air-to-air missiles possible. The first attempt, although unsuccessful, was a 30-tonne Lavochkin La-250 prototype, the last of the Lavochkin design bureau's aircraft. Iosif Nezval of Tupolev Design Bureau led development of the new interceptor aircraft. The work began in 1958, based on an existing single prototype of the unsuccessful Tu-98 supersonic bomber. The military designation of the interceptor was at first Tu-28, but it was changed in 1963 to Tu-128, identical to the designation used by the OKB. The Tu-128 had a broad, low/mid-mounted swept wing carrying the main landing gear in wing-mounted pods, and slab tailplanes. Two Lyulka AL-7F-2 turbojet engines were mounted in the fuselage. The two-man crew of pilot and navigator were seated in tandem. The Tu-128, with its maximum weight of 43 tonnes, was the heaviest fighter to enter service. [nb 1] It was a bomber-interceptor with high wing loading, unsophisticated but reliable avionics and poor visibility. It was not an agile aircraft. It was intended to combat only NATO bombers like the B-52, not engage in dogfights with smaller aircraft. The interceptor made its initial public appearance in the 1961 Tushino air parade. Western experts, unaware that the bulge on the belly carried testing instruments, mistook it for a large ventral radar for a mixed interceptor/AWACS role. The production version lacked the bulge and had a large nose radome housing a radar, known as RP-S[nb 4] Smerch, having a detection range of about 50 km (31 mi) and a lock-on range of about 40 km (25 mi). Armament of the Tu-128 was four Bisnovat R-4 air-to-air missiles (known as K-80 during development; NATO reporting name AA-5 'Ash'). Usually two of them were R-4Rs with semi-active radar homing and two were R-4T infrared-homing missiles, with the former on the outer pylons and the latter on the inner underwing pylons. There was no internal weapons bay. Production of the Tu-128 ended in 1970 with a total of 198 aircraft having been built. Development of various projects designated Tu-28A, Tu-28-80, Tu-28-100, Tu-138, and Tu-148 were proposed by the Tupolev Design Bureau but all were abandoned. The Tu-128's only publicly reported combat operation was the destruction of NATO reconnaissance balloons. The aircraft remained in service until 1990. Through the 1980s, units armed with the Tu-128 converted to the Mikoyan MiG-31, which features much more advanced sensors and weapons. Development test aircraft, one built. OKB designation was 128. In the West, Fiddler-A was used for all the aircraft with twin ventral fins — these included a prototype and a few of initial production (perhaps two planes). Main version, first deployed operationally in 1964 (or 1966 – sources differ). The military designation was at first Tu-28, but the existing aircraft were renamed in 1963. The entire weapon complex (aircraft, radar, missiles) was designated Tu-128S-4. In the Western sources, but not in Soviet, often the more precise designation of this version is mentioned as either Tu-28P or Tu-128P. Training version with an additional cockpit forward of the normal one, in place of a radar. ten built and four converted from standard interceptors. A 1979 modernization of almost all existing aircraft for better interception at low altitude. Development originated in 1970. Engines and airframe were not altered. 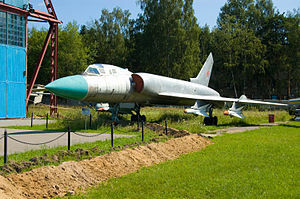 The full designation of the entire weapons complex was Tu-128S-4M. It contained a new RP-SM Smerch-M radar, and new missile set: R-4RM plus R-4TM. New development, variable geometry wings, abandoned. Wikimedia Commons has media related to Tupolev Tu-128. ^ a b Tu-128 was the largest fighter assuming that the definition of "fighter" includes an interceptor aircraft. Tu-128 was not intended for fighter-to-fighter combat (i.e. air superiority battle). For an even heavier interceptor design, which did not enter service, see Lockheed YF-12. ^ The geographical distance between Murmansk and Anadyr is 4,911 km. ^ Some sources provide the radar's designation as RP-5 instead of RP-S, possibly a mistake. ^ a b c d e f g h i j k l m n o p q r s t u v w x y z aa ab ac "Tu-128" (in Russian). Airwar.ru. Retrieved 3 March 2011. ^ a b c d e f g h i j k l m n o p q r s t u Kandalov, Paul Duffy ; Andrei (1996). Tupolev : the man and his aircraft. Warrendale, PA: SAE Internat. pp. 137–139. ISBN 978-1-56091-899-8. Retrieved 3 March 2011. ^ a b c d e f g Spick, Mike (5 August 2002). The Illustrated Directory of Fighters. ISBN 978-0-7603-1343-5. Retrieved 3 March 2011. ^ Mladenov, Alexander (20 April 2017). "Soviet Cold War Fighters". Fonthill Media. Retrieved 29 January 2019 – via Google Books. ^ "AviationsMilitaires.net — Kotlas-Savatiya (Russie)". www.aviationsmilitaires.net. Retrieved 26 January 2019. ^ a b c Leonard, Barry (January 2011). History of Strategic and Ballistic Missile Defense: Volume II: 1956–1972. pp. 109–114, 259–262. ISBN 9781437921311. ^ a b c d e f g h "Tupolev Tu-28". Russiafile.com. Retrieved 8 February 2010. ^ a b Air warfare : an international encyclopedia. Santa Barabara (Calif.): ABC-Clio. 2002. ISBN 978-1-57607-345-2. ^ Roblin, Sebastien (1 April 2017). "Russia's Super-Sized Tu-128 Fighter: The Supersonic B-52 Killer". The National Interest. Retrieved 29 January 2019. ^ a b c d e f g h i j "WWW.AVIATION.RU". Archived from the original on 5 June 2011. Retrieved 5 March 2011. ^ Colon, Raul. "Tupolev TU-128 Fiddler". Retrieved 5 March 2011.